Discussion in 'iPad' started by njchris, Nov 1, 2011. 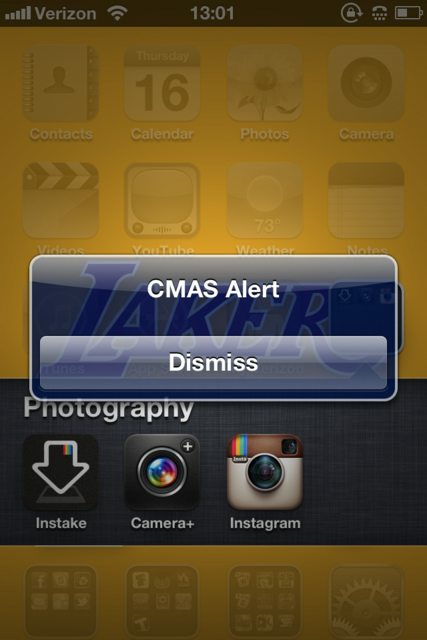 When I woke up today I looked at my iPad and it had a popup on the screen saying CMAS Alert with the only option to dismiss. What was this from? Interesting. I got it on my Ipad2 but not on my iPhone (4s). Hmmm, didn't check my iPad this morning. Our iPhones didn't have the alert. Didn't get one on my iPhone 4s vz, nor my iPhone 4 on ATT but did get one on my VZ ipad2. I just got another on my ipad2 - verizon. My phone is on sprint so prob why only getting on one. From what people are posting here, not every iOS device is getting this message. For those that did, what version of iOS are you using? I have iOS4 on my iPhone and did not get the message, but I did get it on my iPad with iOS5. Is anyone else experiencing the same thing? Also, the alerts are location based. For those that have mixed results, are both devices attached to a phone number? That may be what is used to gather location data. Verizon iPhone 4 and iPad 1 - both on iOS5 - neither got the CMAS Alert. I have an Ios5 ipad2 Verizon. I'd like to know what they are letting to. Verizon iPhone 4 with iOS5. Actually got the alert twice, once in the morning when I woke up and once sometime in the afternoon. There is an FCC effort to give government the ability to "warn" wireless devices based on the "tower umbrella" the phone is under. CMAS and PLAN are used by FCC and FEMA. WEA is used by ATT and VZW. VZW says no APPLE product will work with this system. Apple says they will. The rules for this program say all new equipment and those modified are expected to work by April 2012. Go figure? This is a real crazy one. The Commercial Mobile Alert System (CMAS), also known as the Personal Localized Alerting Network (PLAN), is an alerting network designed to disseminate emergency alerts to mobile devices such as cell phones and pagers. The Federal Communications Commission proposed and adopted the network structure, operational procedures and technical requirements in 2007 and 2008 in response to the Warning, Alert, and Response Network (WARN) Act passed by Congress in 2006, which allocated $106 million to fund the program. CMAS will allow federal agencies to accept and aggregate alerts from the President of the United States, the National Weather Service (NWS) and emergency operations centers, and send the alerts to participating wireless providers who may distribute the alerts to their customers via text messages. The government plans to issue three types of alerts through this system: alerts issued by the president, alerts involving imminent threats to safety of life, and Amber Alerts. The system is a collaborative effort between the Federal Emergency Management Agency (FEMA), the Department of Homeland Security Science and Technology Directorate (DHS S&T), the Alliance for Telecommunications Industry Solutions (ATIS), and the Telecommunications Industry Association (TIA), although there has been some controversy regarding the willingness of FEMA to participate. Within ten months of FEMA making the governments design specifications for this secure interface for message transfer available, wireless service providers choosing to participate in CMAS must begin development and testing of systems which will allow them to receive alerts from alert originators and distribute them to their customers. Systems must be fully deployed within 28 months of the December 2009 adoption of such standards and are expected to be delivering alert messages to the public by 2012. Although not mandatory, several wireless providers, including T-Mobile, AT&T, Sprint Nextel, and Verizon have announced their willingness to participate in the system. Providers who do not wish to participate must notify their customers. Customers will be automatically signed up to receive PLAN alerts. If they do not want to participate they may opt to block most PLAN messages, however messages issued by the president cannot be blocked under any circumstances. I just got this, too! I got this as well today and I'm also on Verizon. Does anyone know what it means. I understand the acronym, but why no other details if it is an "alert" of the emergency type? Or was this some hacking test that was done? I digress. Funny no one else I know got this.. Guess it's just for select iPhone users? Or it hasn't rolled out to everyone else yet.